In this article you will find what’s retinol, is retinol good for your skin and what does retinol do for your skin? Retinol is derived from vitamin A and has long been well known for its anti-ageing properties. A number of studies have shown that applying this magical ingredient topically can increase the amount of collagen that your body produces, plumps out skin – reducing the appearance of fine lines, wrinkles, pigmentation and acne. Well, the retinol is one of the few ingredients that have been found to actually work. This magical potion does almost everything good for your skin! It soaks into your skin, boosting cells turnover, thus revealing newer and smoother skin much faster. And many reputed manufacturers of skin care products are going gaga over it, vying with each other to offer superior quality products containing retinol. It’s all because of retinol’s impressive ability to reduce wrinkles, and besides that it has many other miraculous benefits for your skin. Let’s look into the retinol benefits for skin. Retinol is tried, tested and proven star ingredient to treat various skin conditions such as wrinkles, fine lines, large pores, acne, blemishes, pigmentation and uneven or dull skin complexion. Retinol is a powerful anti-aging ingredient that really fights against aging & prevents wrinkles occurrence on the skin. It boosts formation of collagen, which otherwise gets depleted in your skin with age and results in to fine lines and wrinkles. Collagen eventually helps the skin to rejuvenate, firm up, and so provides healthy appearance. That’s why it’s the key ingredient in many anti-aging skin creams. When retinol is present as the main ingredient in a skin cream, it stimulates inactive metabolic substances in the skin and energizes your skin cells. This triggers the skin cells to get rejuvenated, thereby boosting much faster healthy cells growth. The quicker production of healthy skin cells leads to a visible reduction in wrinkles and fine lines, providing a younger look to your skin. 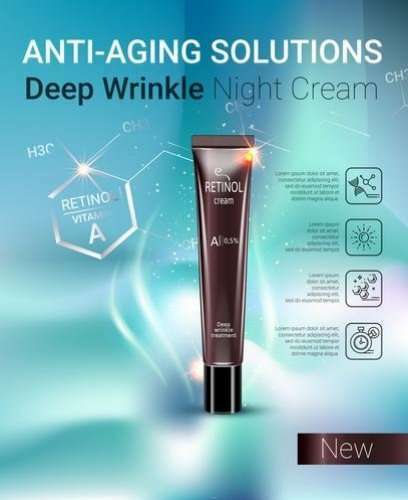 The retinol products not only lessen the amount of wrinkles on your face, but its regular use firms up and tightens your skin and also minimizes formation of new ones. The regular users can see dramatic results eventually. Some regular users of good quality retinol creams claim to see dramatic results with in a couple of weeks. Do you know that retinol was initially recommended as an effective treatment for acne? Later on when its anti-aging properties were discovered, it was rebranded as anti-aging product as well. It controls oily skin, as well as unclogs skin pores and prevents further build-up, meaning fewer blackheads, cysts, and pimples. When your skin pores remain cleared of the build-up and breathe, you’ll suffer from fewer breakouts. And here is best news for you, retinol has been shown to both prevent AND undo acne scarring. Retinol exfoliates skin from a cellular level, revealing brighter, smoother, and, really, newer skin. Retinol products fade away dark spots, sunspots, acne scars and hyperpigmentation, thus eventually help to even out your skin complexion.